1 Put the lamb mince, seasoning, onion and mustard into a large bowl and mix together thoroughly. 2 Divide the mixture into four and shape into burgers. Line the grill pan with foil and place burgers under a preheated grill and cook for about 12 minutes until golden and cooked through. 3 To make the Welsh rarebit, mix together the mustard, cheese and beer. 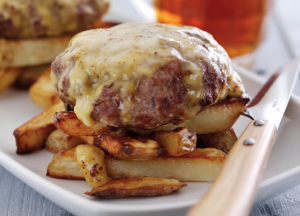 4 During the last 1-2 minutes of cooking, place the rarebit in a mound on top of the burgers and allow to melt and ooze over the burger. Collect any juices in the bottom of the grill pan and spoon over the burgers. 5 Serve with chunky fries and seasonal salad or slaw.